Check out the latest CDI rankings on our interactive website. 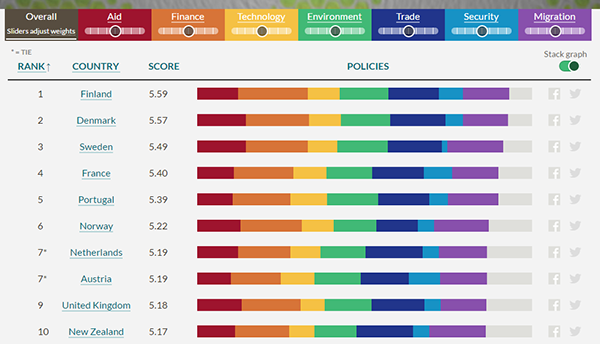 Now in its 14th year, we derive the CDI rankings by crunching the numbers from millions of data points across seven policy areas: aid, trade, migration, finance, security, technology and environment. The result is a measure of which country has the most development-friendly policies. It shows where countries do well and how they can learn from each other to do better. We want to show how development can be a race to the top. Most of the policies that score well on the index require some sort of international cooperation—so what does the CDI tell us about the apparent retreat of globalism across the political landscape? Take a listen to the podcast to find out! And please also check out the interactive CDI rankings to see where each country stands and how they could improve.